The New Zealand Transport Accident Investigation Commission has released its report on the 2017 accident in Port Chalmers, Dunedin, on board the cruise ship Emerald Princess, in which a nitrogen cylinder burst, causing one fatality. The report highlights a lack of global minimum standards for inspection, testing and rejecting pressure cylinders for stored energy systems on lifeboat launching installations – a system common on cruise ships. In February 2017, the crew of the Bermuda-flagged Emerald Princess were re-pressurizing the gas cylinders after maintenance of a stored energy system ( that provides an alternative means of launching lifeboats in the event of power failure.) 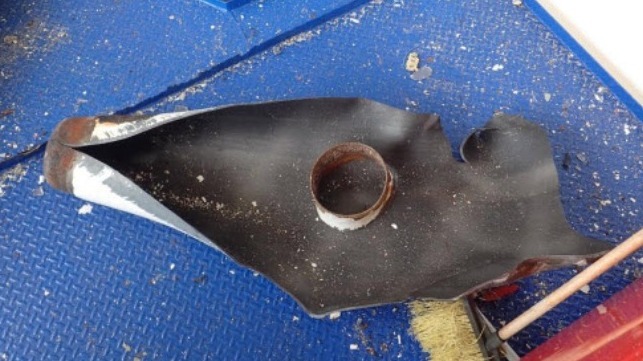 The investigation found that the cylinder casing of the exploded cylinder had become weakened by corrosion and was about 30 percent of original thickness. The crew were following the correct procedure for recharging the nitrogen cylinders when it burst. There is no clear evidence as to why the cylinder was so heavily corroded in the area where the failure started. The adjacent cylinders in the frame were not heavily corroded. However, the failed cylinder and several others in the system were not fit for purpose, says the Commission, despite having been surveyed recently, and should not have been in service. The maintenance plan on board the Emerald Princess stated that nitrogen cylinders were to be hydrostatically tested every 10 years. The vessel’s flag state also required that the nitrogen cylinders be tested every 10 years. The nitrogen cylinder that burst had been manufactured in September 2005 and was due for hydrostatic pressure testing in September 2015. At the time of the accident the cylinder had not been pressure tested and was overdue by one year and five months. The maintenance plan had been loaded with the date when the cylinders were installed on the ship at the time of building, rather than the date of manufacture. At the time of the accident, the most recent inspection had been a five-yearly inspection that was carried out on January 21, 2017, 19 days prior to the accident. The five-yearly inspection report prepared by the authorized service provider stated that the nitrogen cylinders on board the Emerald Princess were aged and the company should consider swapping them with new nitrogen cylinders. • There is a lack of global minimum standards for inspection, testing and rejecting pressure cylinders for stored energy systems on lifeboat launching installations, so there is wide variation in, and sometimes inadequate, standards applied by flag state administrations, classification societies and authorized service providers. • Technicians who are authorized to conduct mandatory annual and five-yearly inspections of lifeboat-launching installations are not required to have specific training and certification for inspecting any stored energy-release systems and their associated pressure cylinders. The Commission recommends that the manufacturer of the lifeboat launching system improve training and that Maritime New Zealand raise the urgent global need for adequate minimum standards with the IMO.